The vision of Whitesell Construction is clear: Design high quality buildings customized to meet the client's operational needs while maintaining ownership and management. As if that isn't a tall enough order, their vision also includes providing captivating landscape appeal that reflects a community-friendly and timeless appearance. This dedication to excellence in design, construction, maintenance and management has been the primary factor in Whitesell's success as one of southern New Jersey's largest family-owned developers of commercial real estate. Founded by James P Whitesell in 1954, the company began as a residential builder of customized homes. He worked hard to establish a strong reputation for distinctive design. Thomas Whitesell, son of the late James P Whitesell, began his career at age 12, marketing home sales for the family. He worked tirelessly, taking over the daily operational duties of the company as he sought a new direction to strengthen and secure the future. Early on he envisioned serious potential for success in the commercial market. This marked a serious turning point in the direction of the company. Later, "the limited availability of commercial work for builders launched Thomas Whitesell's venture into real estate development," according to Richard Cureton, executive vice president. "He wanted to generate projects to keep his workforce busy during slow times, and he realized that it made sense to build them, lease them, finance them and go on to build the next one." Tom thus began building on speculation, at first for the Whitesell family portfolio. Next came third-party development for other companies. Thomas Whitesell further expanded the company by reorganizing the operational structure and establishing in-house capabilities by hiring his own architects, structural engineers and interior designers. Eventually, he included his own management team and marketing specialists, creating an entrepreneurial enterprise that is vertically integrated and self-sufficient. Throughout 40 years of leadership, the legacy of customer satisfaction initiated by his father has remained a priority, supported by a seasoned team of highly knowledgeable commercial construction professionals. The development of numerous buildings located at the Pureland Industrial Complex in Gloucester County marked the progressive introduction of the Industrial Parks Concept. This established Whitesell as a leader in the creation of customized office, production and distribution centers for their markedly diverse clientele. The Millside Industrial and Office Park in Delran Township, home of Whitesell Construction headquarters, was later developed. In addition. the Laurel Corporate Center and the 700-acre Haines Center in Burlington County further established Whitesell's achievements as a premier park developer. The company gained greater recognition outside of Burlington County with the carefully planned and constructed high-security office facilities built for G. E. Aerospace's involvement in the "Star Wars" program, located at the Martin Marietta regional complex in King of Prussia, PA. The contemporary and structurally aesthetic appeal of the G.E. buildings became an important part of Whitesell's widely respected reputation for excellence and proficiency from the drafting table to the finished product. It is no surprise that Whitesell Construction has received numerous awards and marketplace recognition for its superiority in design and development. These include "Best Mid-Rise Office Structure" by the Builders League of South Jersey, and the "Building Excellence Awards of the Delaware Valley" for 1989 and 1991 by the New Jersey Business and Industry Association, to name a few. Whitesell has also initiated diversity in their product mix, which is evident in their varied achievements. The company's venture into the industrial "big box" market has resulted in large distribution facilities for BJ's Wholesale Club and the Sports Authority, both located at the Haines Center in Burlington County. In addition, the creation of a residential portfolio, MCW Enterprises, consisting of several suburban gated apartment communities, has taken Whitesell back to its residential roots. Whitesell has also embarked on a new office campus development in Mt. Laurel for Lockheed Martin encompassing 400,000 square feet of mid-rise buildings nestled around a series of ponds and waterfalls. Because Whitesell retains ownership of every new trademark structure it creates, even greater care and consideration are given to all aspects of construction from detailed planning to the high quality service provided to clients long after the "grand opening." It is this steadfast commitment to service that has fostered great involvement in the local community. Thomas Whitesell has served on many charitable boards in the area, most recently donating land and various services to assist in the expansion of Family Services of Burlington. Bob Richards, president of Whitesell, sits on the board for Virtua Health Systems and is very involved with their impact on the southern New Jersey area. In addition, Richard Cureton, executive VP, serves as president emeritus of the Burlington County YMCA. The company also provides financial support to local charities and college scholarships to local youth. The success of the Whitesell Construction Company is due in great part to the diligence, integrity and proven skills of their highly qualified team of professionals. "We very much try to treat the company as a close-knit team, from top management to the staff that works in the field. We recognize the perseverance and contribution of all employees, from the skilled craftsmen to the accounting staff and construction team. It is this family-oriented style of management that translates into exceptional standards and distinction on every project," says Bob Richards. Currently, Thomas Whitesell remains involved and instrumental in the management of the company, while allowing the next generation of the Whitesell family and management team to take on greater responsibility. Bob Richards, formerly president of Midlantic National Bank/South, joined Thomas Whitesell in 1989 to form the core of the management team. He is assisted by Richard Cureton, executive vice president; Mike Merkle as executive vice president of Construction and MCW Operations; Joe Alber as CFO; and Tom Heitzman, executive vice president, and Terrance Huettl, an engineer serving as VP of Development, both sons-in-law. With an established family tradition of quality product, Whitesell Construction has maintained a diverse portfolio with over 15 million square feet of commercial space. It is Whitesell Construction's strong belief in relationship building with clients, the financial community and the real estate brokerage community that has helped to strengthen its reputation as a leader in design, construction and management of property. 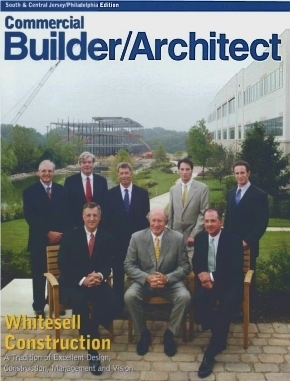 As Whitesell Construction approaches 50 years of continued excellence, it is the core philosophy of assured quality product, exceptional service and sound planning for the future that will secure its legacy as an owner/ developer of projects designed well, built well and managed well.